I have been playing around with making my own chocolate and I have been using chocolate transfer sheets to make it look pretty. These are so easy to use. You pour the chocolate onto the transfer sheet, spread it thinly with a palette knife and once set peel off the transfer, leaving the design behind on your chocolate. Pick ‘n Pay sent me an Easter Egg hamper. It was filled with the most amazing selection of Easter Eggs and I made sure we waited until Easter weekend before tucking in. As I did not think Dave would need to eat all the eggs I was given, I gave many away to our staff, and their children. 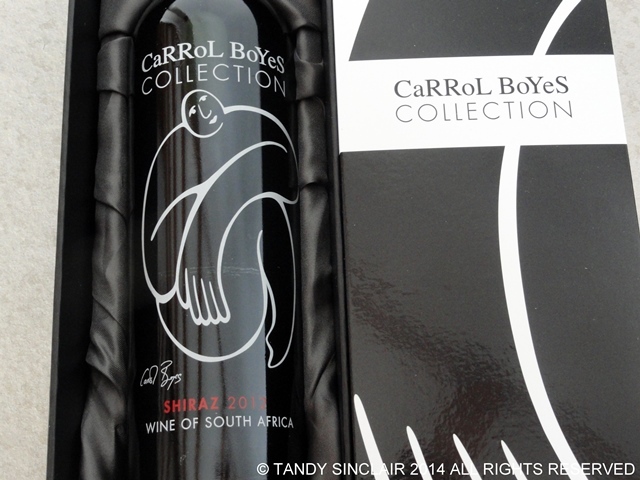 Together with the Easter Egg hamper I also received a bottle of Carrol Boyes wine in a beautiful box. It is a 2013 Shiraz and I am going to leave it to mature a little bit before we try the wine. At the SASSI award evening I was given a goody bag. The goody bag itself is a Women Entrepreneurship Fairtrade bag and is being used for grocery shopping. 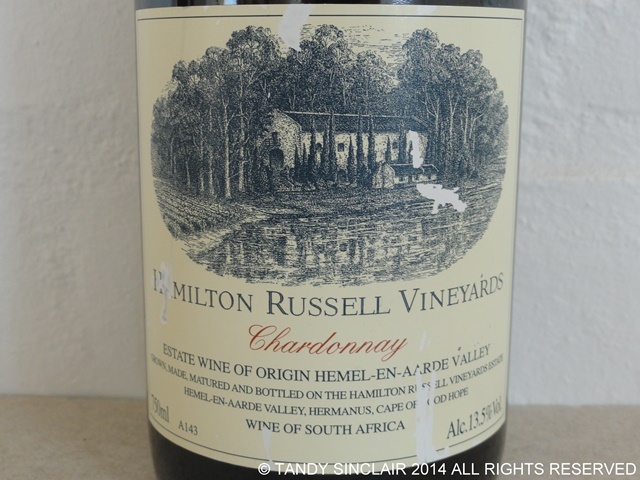 In my bag was a bottle of Hamilton Russell Chardonnay which I will save for when we have guests over who drink white wine. There was also a Grip N Go bottle. I have been meaning to go to the Consol factory shop in Stellenbosch to get one of these, so the gift is really welcome. I keep water in my car and a glass bottle is far better than anything else. Now I just have to get used to bringing it inside when I get home or when I am at work. And last but not least in the bag was a bottle of Olyfberg Olive Oil. 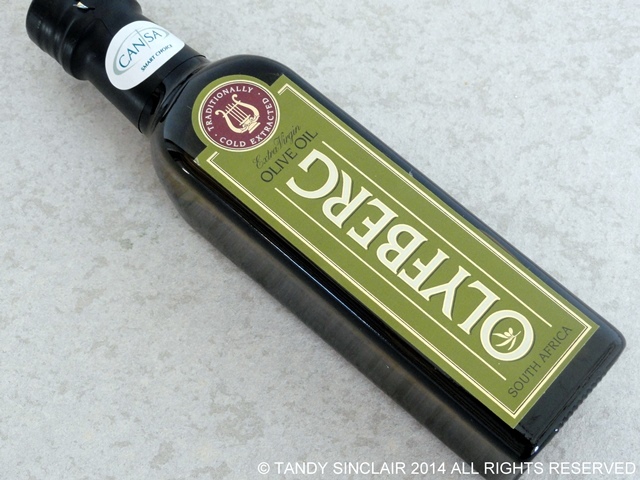 I love getting olive oil as gifts as we use so much of it at home. I probably buy 4 bottles a year and we use at least a bottle a month if not more! 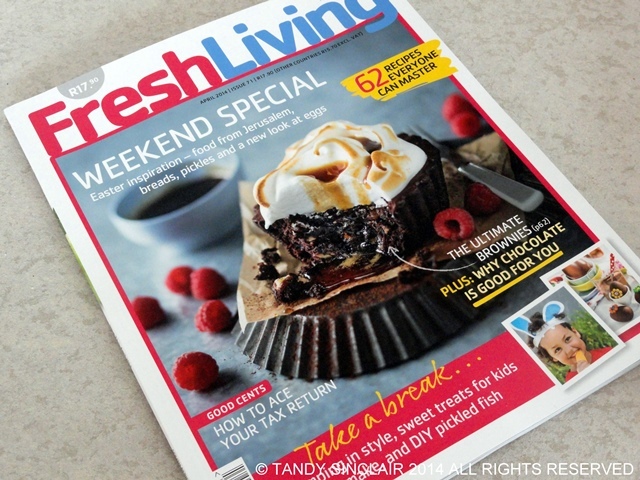 I purchased the April issue of Fresh Living which has the last feature of Sam’s recipes in it. This magazine is not usually on my shopping list but in support of a friend, I have bought all three magazines that she featured in. 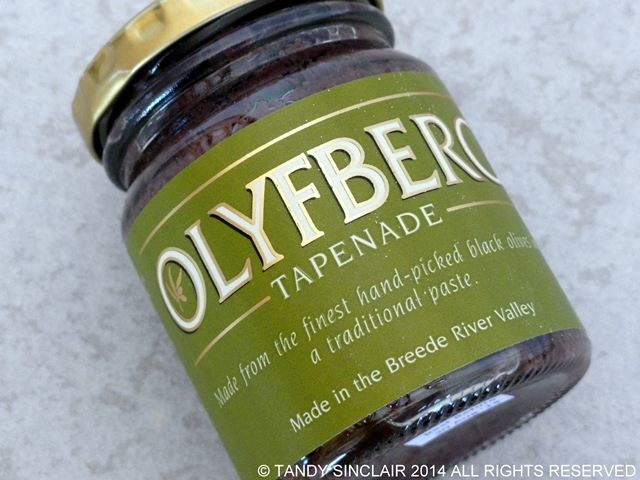 I was sent a bottle of Olyfberg Tapenade in the post. It was quite a miracle that it got to me as we do not have a post box at home and the parcel was posted to my home address. This after the courier could not find our office. As parcels are not delivered to street addresses in South Africa, the collection slip would have been stuck into our gate by the postman. Under ordinary circumstances, anything stuck into our gate ends up blowing away in the Gordons Bay wind. However, this day, the rubble removers were busy removing the rubble from the pool we are busy digging out, and the postman gave the slip to our gardener who was supervising the removal. I collected the tapenade which is made from a secret, tasty mix of chopped olives, herbs, garlic, capers, lemon and black pepper (official press release) from the post office and I cooked it into some chicken for dinner. It is really tasty and I look forward to coming up with a few recipes for the tapenade. Hopefully the next item is Shaoxing Chinese Wine. We have a Chinese market in Somerset West but the lady who runs it does not speak English and I don’t speak Chinese. I am not even sure that the way I pronounce Shaoxing is correct. 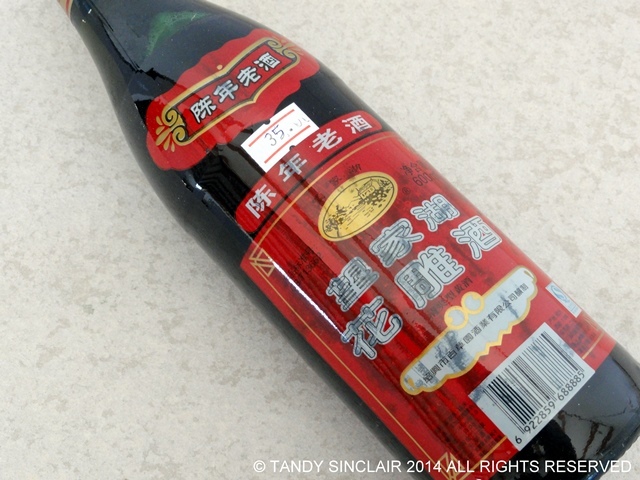 I asked for Shaoxing Chinese Wine and she assured me that the writing on the bottle says Shaoxing! I don’t even know what it is meant to taste like but I am going to hold thumbs that I have the correct stuff as I am using this for a recipe soon. If you want to join in with an IMK post then please head on over to Celia from Fig Jam And Lime Cordial! Disclosure: The gifts I received were not given with the requirement that I post about them. This post is in line with my blogging policy. It looks like a very good month for chocolate in your kitchen! 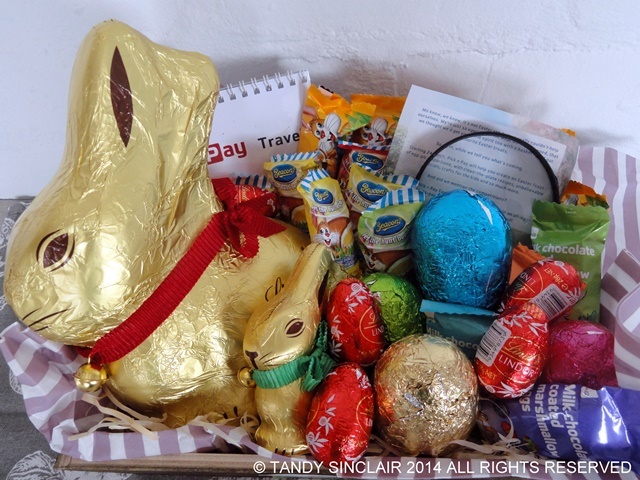 What a great hamper, and even more impressive, what great chocolate you made yourself. I like the look of that ‘grip and go’ bottle too. Tandy, your chicken dinner sounded delicious, especially after all it took to receive the tapenade — fun story with a tasty ending! The Grip n Go bottle is a great idea, too. Re-usable is even better than recyclable! 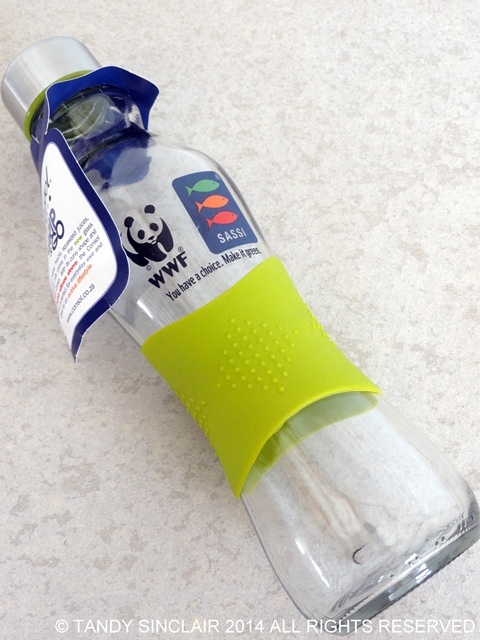 I now have to re-usable bottles and I love them! We had a super holiday thanks! I hope you have more fun with chocolate making! Lovely IMK post Tandy – always nice to receive gifts and that hamper, oil and tapenade look fabulous! Look forward to seeing what you will be posting next month from your trip! Such lovely things in your kitchen this month. I love that chocolate and the tapenade story is cute. Have a wonderful holiday up north! the wine looks good. I’ll pop over and help you drink it! Everything on this post looks heavenly, Tandy… PERFECT for wintertime! Hope you’re enjoying your holiday! We had a super time away! I love the look of those chocolate transfer sheets. They look so professional. I am coveting your glass water bottle. What a great idea to put a non-slip band on it. Hope you enjoyed your holiday. That cake looks amazing. I agree with one of the previous comments, you were meant to have that Tapenade! Getting together with my husband 31 years ago was a very similar situation… shouldn’t have happened, but it did! Hurray for Serendipity! Thanks for your post. I’ve become a little too free and easy with olive oil myself Tandy as I’ve been given a few bottles as gifts. It will be a shame when I have to go back to buying it! And of course now I’m going to have to seek out chocolate transfers. Thanks for the tour. I will taste and let you know! 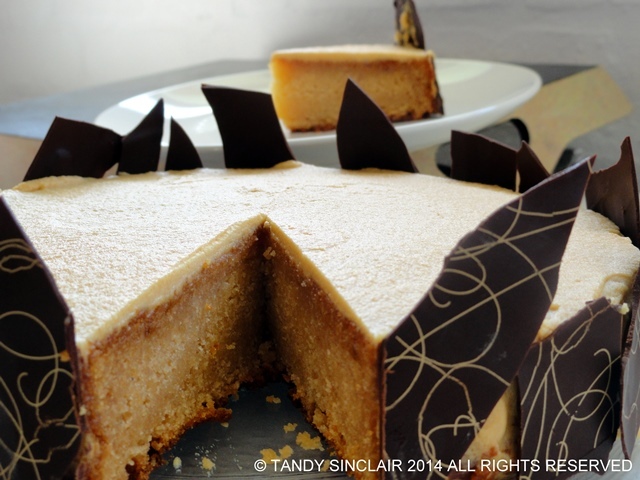 Your cake looks great – like a fancy restaurant! All those gifts and goodies are terrific! And that cake! Can I please have a slice! I am so going to try the tapenade with fish! i love the artwork on the Carrol Boyes wine bottle – just gorgeous. Hope you are having a great time in the UK. Great goodie bags Tandy, looks like your having fun with the chocolate. I love the chocolate transfers! Thanks again for sharing- hope your UK visit is marvelous! G’day! GORGEOUS cake Tandy and love your wines! That Honey nougat cake looks fantastic, Tandy. I’ve thinking about doing the same thing with chocolate…and putting it around a cake. Nice things! Your chocolate is so pretty! Good luck with the Shaoxing cooking wine!! I love going to the Chinese shop and pulling different ingredients off the shelf to try! Many many fails. But some really good ones too! Your chocolate creations are amazing!! I need to investigate some of this transfer paper. it is so much fun to play with! What a brilliant hamper you received Tandy. I have a litre glass bottle which always goes with me in my car – I can’t leave home without my water. I had a Lindt bunny also. So completely delicious. I’ve not tried tapenade but think I might have to now! Whatan interesting mix of kitchen bits and bobs…..I love the chocolate transfer sheets, and keen to try some. They certainly make that cake look very professional, although it sounds absolutely delicious, chocolate or no chocolate!Good luck with your Shaoxing Chinese wine- look forward to seeng what you make with it!